Matching Door Sidelights – Many in Stock! If you are not familiar already with these design elements, sidelights are panels of windows that can be installed to the sides of your entryway door. They frame your door, and should be cohesive with the overall architectural design of the entryway. Doors of Elegance frequently installs matching sidelights in Mandeville and New Orleans in order to make homes feel more light and spacious. When you have the benefit of living in sunny New Orleans, why not let that sunlight into your home? These artistic window pieces can completely transform the look and feel of your entryway. Suddenly, the entire space will feel more open, welcoming, and warm, which is exactly what you want from the threshold of your home. Our design team understands that your sidelights must be able to seamlessly tie into your existing or new entryway door design, and that is why we offer so many different styles. We have sidelights in stock that will match all of the most common materials used in our custom door designs. We offer three-piece units that will match your wrought iron, glass, or wooden front entryway doors. 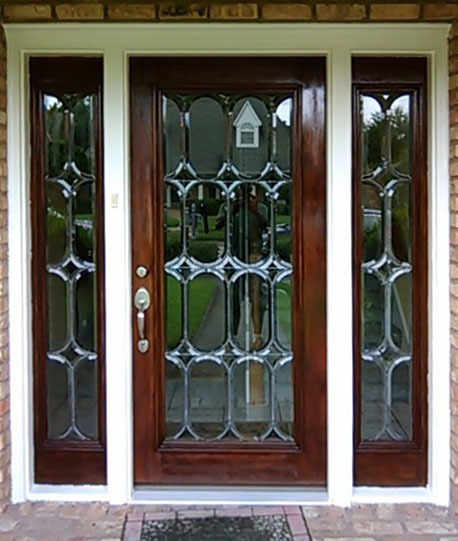 Our sidelights also include styles that incorporate beveled glass, fleur de lis designs, as well as many other unique characteristics. Of course, Doors of Elegance specializes in providing residents in the Mandeville and New Orleans area with custom design door solutions. Our design team will gladly accommodate any of your personal sidelight needs. Many homeowners are torn when it comes to using sidelights because, while they do want that extra light coming into the entryway, they have concerns about having privacy in their home. Choosing beveled glass, or other artistic glass designs, for the sidelights provides an answer to this problem. The unique glass not only adds to the design of the entryway, but it also allows light to filter into the room without allowing people to be able to see inside the home. We would be happy to go over these types of sidelight options with you. Sidelights provide an excellent way to make your front entryway more interesting and creative, and that is why we strive to provide as many design options as we possibly can. Homeowners have the option of choosing sidelight designs that place more emphasis on wood or wrought iron details, or they can have sidelights installed that include intricately designed artistic glass. This large design selection allows homeowners to have more control over their custom door design and the amount of light that they would like to have in their entryway. For an entry design that is more simplistic, yet elegant and sophisticated, we also install a variety of true divided light doors. These designs incorporate simple sidelight panels, with glass pieces of varying sizes. True divided light options are ideal for homeowners who want to benefit from the brightness of having sidelights, without having a lot of ornate wood or iron details surrounding the glass. Installing sidelights to your entryway can be a tedious, time consuming, and difficult process. Our team can take care of this step for you, saving you a lot of time and hassle, and ensuring that your sidelights are installed safely and correctly the first time around. We want to help you begin enjoying your new and improved entryway as soon as possible.